The galaxy’s favorite space-slug gangster, Jabba the Hutt, is one of Star Wars’ more recognizable aliens. 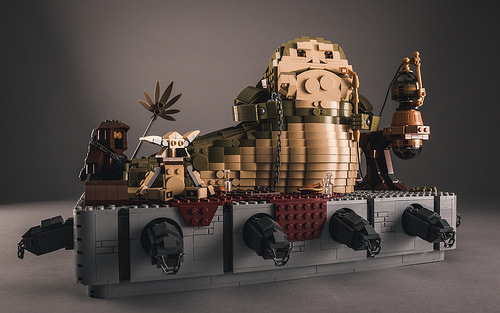 Jabba is cold and cruel, but still enjoys the finer points of life on the harsh world of Tatooine. Robert Lundmark has captured the slimy villain with great attention to detail. The contouring and coloring of Jabba’s massive form is impressive, the base is clean and sharp, the subtly angled face is ingenious, but it’s the eyes that catch my attention most of all. It’s a small detail like that that can really turn a build from a pile of bricks into a living character.